To see the Bigger Picture in NSW click on the picture below. There is more to Life, come see! 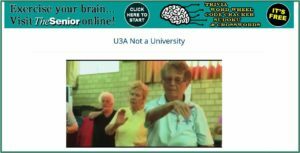 U3A IS THE UNIVERSITY OF THE THIRD AGE. The first age is childhood and youth. The second age is that period of our lives when we earn a living, buy a house, raise a family and generally establish who we are. The third age begins when most of our work and many of our responsibilities are behind us, allowing us to pursue new interests and activities. From the U3A point-of-view it starts with our fiftieth birthday. The University of the Third Age is not a university at all-at least, not in any conventional sense. It is comprised of groups of people pursuing shared interests under the guidance of a tutor who may well learn as much as he/she imparts. Subjects can be academic, general interest or hobbies. In case you were wondering, there are no exams and no homework. WHAT CAN U3A DO FOR ME? In the Nepean-Blue Mountains U3A there are currently more than ninety courses on offer. You can learn a language, paint a picture, study science or astronomy, try your hand at cake decorating, and learn basic computing. There are courses in photography, a scrabble group, and a Friday afternoon slot where you can hone your chess skills. On the physical side, there are walking groups and dance classes-both ballroom and line dancing. U3A has something for everyone. Explore our web page and discover for yourself just what U3A has to offer. It’s as educational as you want to make it and as recreational as you could wish. Class groups are sociable, friendly and supportive.